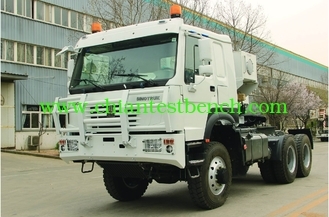 6x6 heavy tractor chassis adopts CNHTC HOWO cab, MAN series engine, ALLISON hydraulic torque converter, large ratio axles, etc. Equipped with high-end assembly, such as American Paccar hydraulic winch, JOST bolster, imported cylinder and pump valves, this vehicle is powerful, advanced and reliable. Its maximum towing total mass reaches 100t. It is mainly used on the road, the transition zone of road and gobi. Its overall performance is at the advanced level of the industry. It is widely used for equipment transition in oil fields and mine fields.